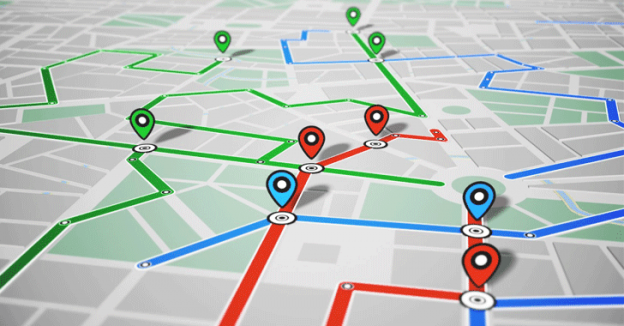 GPS Tracking 101- How better routing can help your business | Tracking Systems, Inc.
One of the main functions of a GPS or Global Positioning System is to pinpoint the location of a vehicle. A good GPS system transmits data in an easy to use format in real time, so you as a fleet manager know where each of your drivers are at any given moment. This knowledge can be used to your company’s full advantage to help you make decisions that increase profitability. through data analysis – A reliable GPS company such as Tracking Systems will produce easy to read reports that will give you the ability to analyze the routes of your drivers over time. If traffic flow patterns in a part of town are not optimal at the time of day your driver is passing through, you may be able to adjust the route, opening time in their schedule to make additional deliveries. through real time dispatch – Looking at driver availability in real time allows a fleet manager to assign tasks to the closest driver to a job rather than the first driver they see available. through a reduction of non-productive behaviors – GPS gives you the ability to look at and address driver behavior that is getting in the way of their productivity. When the fleet manager is aware of excessive idling, downtime or depot stop time, they can begin an open dialog with the driver and put parameters in place that motivate them to improve their performance. by eliminating overtime – By adjusting routes and addressing non-productive behaviors fleet managers can take steps to eliminate overtime. by eliminating out of route miles – The most expensive miles are the ones you didn’t need to drive. Utilizing Tracking Systems detailed reporting you can take a closer look at your driver’s day and make the necessary changes to optimize their route. by eliminating fuel theft – An unfortunate issue facing many companies. GPS tracking provides you with the data needed to find out if the fuel being purchased is being used for the good of the company. with visibility to real time data – When you can see where a vehicle is at a point in time and have access to real time GPS data, you are better able to inform customers of more accurate estimated arrival times. Not only that, you are better able to anticipate potential delays and quite possibly adjust so that scheduled delivery times or appointments are not missed. Tracking Systems wants to help fleet managers and the companies they work for increase productivity, reduce costs & improve customer service through route optimization. If you would like more information about Tracking Systems’ features and support, give us a call at 845-738-2200 or visit our website at www.track-sys.com.